Is it really almost the end of June? Where has the month gone? School resumes in just four, short weeks! 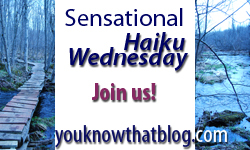 This week's theme to Jenn's Sensational Haiku Wednesday, over at You Know...That Blog? is living. Since I've always considered life somewhat of a rollercoaster, this is the bend I chose to take on this week's theme. It reminds me of the internet joke floating around about arriving in Heaven, not clean, pristine and neat, but all used up and saying, "Man! What a ride!" Believe it or not, merry go rounds and other things that go in circles are far more likely to make me sick than the wildest roller coaster. go figure. good thing - my life is an extreme roller coaster ride! No hands!! Oh, I know! As I get older, I can't do the merry go rounds or the tilt a whirls - no way, no how.